Posted by David Boyce in Editorial, Lists, NECA with 3 comments. In another reality Konami wouldn’t be insane. They wouldn’t have dragged their heels and burned bridges with NECA on this set. In this reality they make a lot of money, start a beautiful relationship, and we finally get Metal Gear Solid figures that aren’t $100 bucks a piece that show up every couple of years. It’s really an amazing figure and the best version of the character. But there are also 32 other versions of Gipsy out there. This thing. THIS F’ING THING! I don’t own this. I have the Foot Clan set so far, but I have a few friends who own it and I’ve seen it in person. Those colors pop, and the attention to detail in designing the pixel-like look are fantastic in their simplicity. It’s a crime that NECA couldn’t mass produce this set. I can understand Playmates not letting them. It’s their bread and butter after all. This set would be number one with a bullet if I owned it. Yeah it’s a video game, and no NECA didn’t make Doom Guy. But I can’t state enough how awesome that game is. I loved it so much I bought several other copies for my friends. Amanda is a human figure that NECA didn’t have to worry about getting likeness rights for, which is probably the reason she was made. I always welcome more humans over another Alien repaint (even though I still buy them all). Hopefully in three years they will revisit this and give us the Worker Joe android packed with the rigged weapons and accessories that Amanda used in the game. Ol’ upside-down face was actually the first Kaiju I bought, and is best out of the bunch due to his hatred of and invasion of Australia. Seriously, those brown spiders are no joke. ‘NO SIGN OF THE MOOOORNING COOOOMING! It was either that or ‘Number of the Beast’ from Iron Maiden. Linda Hamilton is often forgotten about when people talk about the Terminator franchise. It’s usually just Arnie, maybe the T-1000, then a bunch of disgust as we remember most of T3, Salvation, and Genisys. To be fair, I thought Genisys started off cool in that ‘Star Trek/Mortal Kombat 9’ reboot way, but then they started hot dogging in present day helicopters and John Connor became a robot when he got too close to Dr. Who. I knew it was downhill from there. Crap, forgot about Linda again. SEE? Evil Dead 2 is often recommended to people in search of a unique horror experience. Personally, I think it’s a goofy slapstick movie with a few buckets of blood for the hell of it. This figure encapsulates the buffoonery that is Ash Williams during his fight to stay alive and keep his sanity in a middle of nowhere little cottage. ONE OF THE FEW PREDATORS TO HAVE THAT PISSED OFF BADASS OPEN MOUTH SCULPT AND PROBABLY TYPES IN CAPS LOCK. I was gonna do a full write up on him but I felt too much time has passed. I apologize, but here is a quick overview. He sports a space witch doctor mask with bendable death tentacles along with several gorgeously painted dreads colored in shades of orange and bright white! Clan Leader is another recipient of the Alien vs Predator mold like Scarface, so he also towers over most of the other Predator like a leader should. Clan Leader is not optional if you collect Predator figures. HOT TAKE ALERT: Those live action TMNT films are terrible, but man do I love Henson puppets. The time and care put into Donnie is amazing, and when I’ve shown pictures of him to friends and family they didn’t even realize he was a toy at first. This is the first ¼ scale figure I bought since NECA’s original Jason Vorhees was released back in 1873 or so. Amazing! Vasquez was a figure I thought I would never see in NECA’s Alien line, with likeness issues always being a huge hurdle (SEE: Carl Weathers doing his yearly jerking the chain of getting a Dillion figure made) early on. NECA seemed to have shown its hand on actors who opted in within the first few waves. When she was announced along with Newt and Frost, fans were elated. Maybe we will finally get Paul Riser to agree to have a Burke action figure made! I can’t believe I just said that and meant it! Vasquez was also the first figure to come with a fully fleshed out Smart Gun, unlike the one that came with the Kenner-Style Ripley. 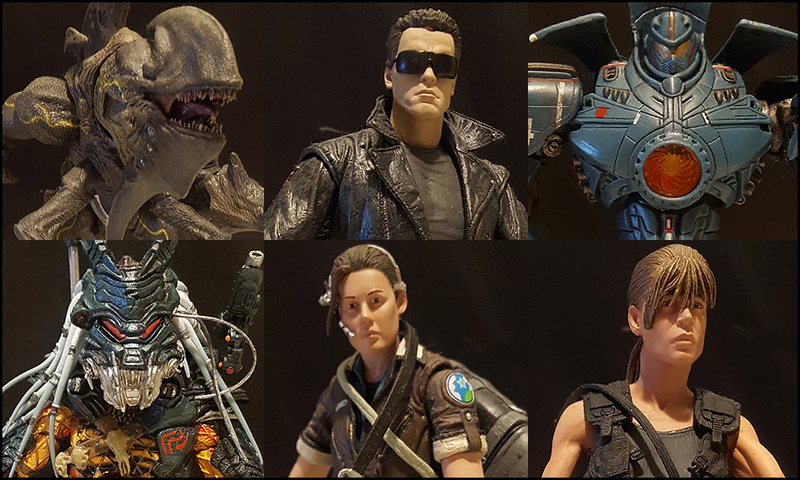 After Hudson, Vasquez was my favorite character in the movie, and I’m glad NECA was finally able to immortalize her in plastic form. BONUS DAVE’S FIGURES HE HOPES NECA MAKES IN 2017! The first live-action TMNT film was not terrible, those that followed were, but not the first. It had a killer soundtrack! Probably one of the first tapes I ever owned. Hopefully in three years they will revisit this and give us the Worker Joe android packed with the rigged weapons and accessories that Amanda used in the game. Hopefully we’ll see some of the USCM and Weyland-Yutani PMCs from Colonial Marines before they ever think about producing a blue-skinned department store mannequin in a safari jacket.